No one is going to tell you that it’s fine to have a slow and unstable Internet connection. Therefore, Internet speed is very important and in interest of every internet provider is to ensure you with a high-quality service that offers high speed Internet. 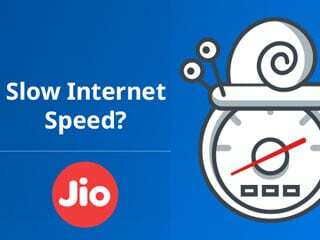 Before we show you how you can increase the Internet speed on your JioFi routers, you should check this list of reasons, which will answer your questions and tell you why are your download and upload speeds so low. 1 – At the start of every day or month you are supposed to make your own plan and limit your data usage. When you pass that data usage limit, your internet speed will get decreased to 128kbps. So, before do anything else, check out your plan and did you surpassed your daily or monthly limit. 2 – Next thing you need to check is the signal intensity. Network indicator will show you how strong is your network coverage. Green or full bars point out to good and strong connection. On the opposite side, blue or 2-4 signal bars indicate that your Internet signal is weak. 3 – Test your internet connection on other sites or apps. Sometimes it happens that problem is with the specific site, and on the others your Internet works fine. 4 – You need to check the distance between JioFi router and connected device, because if that distance is more than 10 meters, Internet speed could be lower than usual. 5 – Same as distance, number of connected devices is very important. Anything up to 10 devices is fine, but more than that will probably cause some problems. You should also check if there are any physical barriers (walls, microwave, etc.) between your router and device. The JioFi router should be places in an open space. You can watch this short video tutorial that will explain you how to solve this slow internet speed problem with ease ! Now, when you know what can cause you problems with Internet speed, you should learn how to fix it. Here are the Tricks and Tips, which should be very helpful. 1 – Place your router in open space from where it can send signal all over, rather than near the walls or any other interference where signal will be weakened. 2 – Tip 2. Another thing that should be checked is if the DNS is changed to Open DNS or else, choose the Google DNS. 3 – You need to create a Wireless Encryption Password on your JioFi router. Make sure that only you and the people you gave the password to have access on the Internet. That will limit number of users and prevent problems with connection. If there is anything not clear in this guide, if you have a problem that couldn’t be solved without an assistance, contact us and write to comment section, someone will answer you soon as possible.